Review: A superb example of a hefeweizen, with luscious citrus flavor and a satisfying after-taste. Trader Joe’s have managed to create a very authentic German style beer, with a striking similarity to Hoegaarden. The color is a pale amber, offset by the pure white, dense frothy head. The Germanic influence is strong, with a lush, wheaty flavor, resulting from the strict adherence to the German purity law. With a taste expected in nothing less than a premium craft beer, this hefeweizen is a must-buy at a rock bottom price. Food pairing: This beer is a joy to drink on its own and would pair up very well with salty foods of any type. 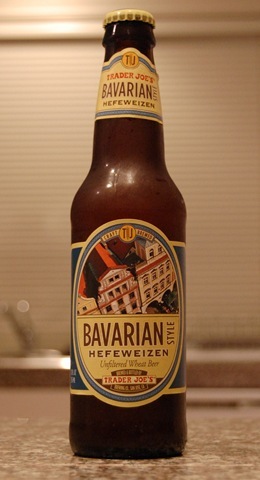 Have you tasted Trader Joe’s Bavarian Hefeweizen? Do you agree/disagree with our rating? Share your thoughts and opinions in the comments. Review: Evokes an Autumnal night in Bruges: it’s raining outside, but why leave – this is the perfect beer for an evening by the fire. 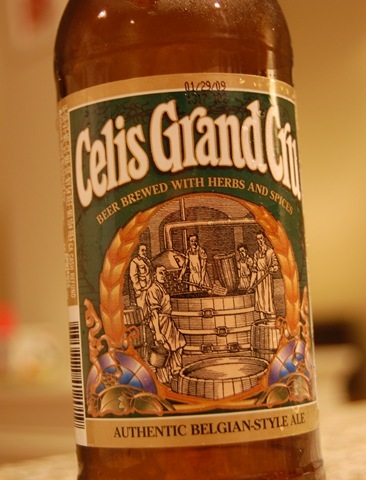 A very drinkable beer with a large flavor, the Celis Grand Cru is ultimately hugely satisfying. Aroma is nicely rounded. Full mouth flavor with delicate, perfectly balanced carbonation that lasts right to the end of the glass. Food pairing: In keeping with the Belgian theme, try this beer with mussels and fries (plenty of garlic would be good). Have you tasted Celis Grand Cru? Do you agree/disagree with our rating? Share your thoughts and opinions in the comments.